If you’re looking to build trust as a financial institution with your customers you can make them feel secure by providing them with our customer service oriented program. NEARLY 81% OF SMARTPHONES USERS HAVE HAD THEIR PHONES LOST, STOLEN, OR BROKEN. Whether we admit it or not, we have become overly dependent on our cell phones. We rarely go anywhere without them. We use them for texting, taking pictures and video, instant access to information, turn by turn directions, checking social media, mobile banking, and of course – verbal communication. Our phones have become one of our most valued possessions. Our cellphones have sensitive data stored on them, and often contain work email and access to confidential workplace information. With cybercrime and hacking increasing by 60% in the past year, and the cost of new smartphones exceeding $1,000, it is imperative to properly protect your phone from theft and physical damage. Secure Identity Systems offers a state-of-the-art cell phone protection plan called Secure Mobile. This innovative solution includes features such as Find Your Mobile, which allows you to map and track the location of your smartphone. Even if your phone battery is dead, you can still identify the last location your phone was powered on using SecureMobile’s Battery Beacon technology. Still can’t find your phone, or afraid it might be stolen? 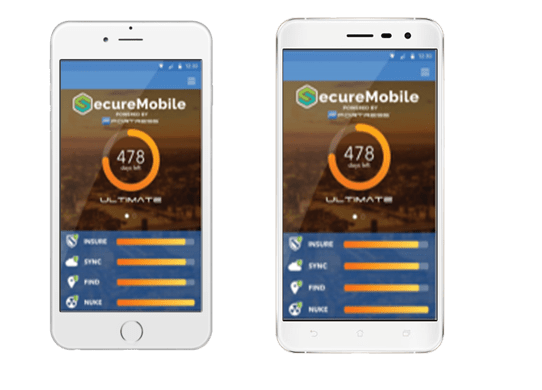 Our advanced technologies will also allow you to remotely secure your data by locking or wiping your device using our Nuke Your Mobile feature. This will immediately turn the phone into an expensive paperweight until you are able to successfully retain possession of the device. Secure Mobile also gives you a private and secure portal to backup, transfer, and restore data to your cell phone. If your customers need to submit a claim to replace your device, a new phone of the same make and model will arrive the very next day. Our total loss replacement has a lower deductible than any carrier in the country. SecureMobile keeps you both protected and connected in our fast-paced digital world.